Dr. Navneet Sharma was involved in an accident that caused significant pain and limitations. Through physical medicine and rehabilitation, he was able to get past those limitations. This experience served as the inspiration to study physical medicine and rehabilitation and share that knowledge with others. “It is an honor,” he says,” to serve this area and help promote wellness and independence from pain and suffering”. Dr. Sharma diagnoses and manages the treatment of medical conditions affecting the central nervous system, skeletal system, muscles, ligaments, joints, and tendons. This is typically done through a rehabilitation program designed specifically for each patient and can include physical therapy, pain management, and patient education. Dr. Sharma works with patients of all ages and is currently taking new patients. Dr. Sharma is the first provider to introduce regenerative medicine to Ruston. Regenerative medicine includes PRP Therapy and Stem Cell injections to repair/regenerate damaged joints and tissue. 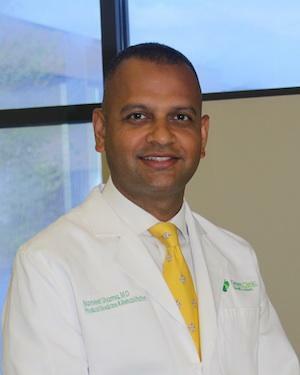 Dr. Sharma enjoys music, LSU and Saints football, hiking, scuba diving, and gardening. A big proponent of fitness, he is involved in Cross Fit. “Potential of Bisphosphonates in the Management of Pain in Pott’s Disease.” Navneet Sharma MD; 24th Annual Medicine Research Day, Louisiana State University Health Science Center, New Orleans, LA and Invitation to 2014 Academy of Spinal Cord Injury Professionals (ASCIP) Conference, St. Louis, MO.